WEST AKRON — The restoration of the historic Glendale Cemetery Bell Tower was set to begin this week as part of a partnership between the cemetery’s friends group and another local historic landmark. The project is a collaboration between The Friends of Historic Glendale Cemetery and ARRC Inc., the for-profit subsidiary of Stan Hywet Hall & Gardens, which will serve as the construction manager. Braun & Steidl Architects Inc. has developed restoration plans for the project, which include the restoration of the tower’s heavy timber bell and roof support structure, the roof framing and roof, the platform at the top of the tower and the bell itself. ARRC officials said Glendale Cemetery and Stan Hywet have a connection, as the cemetery is the final resting place of F.A. and Gertrude Seiberling, who built Stan Hywet Hall a century ago. ARRC officials said the tower had fallen into disrepair after being vandalized decades ago and from age. 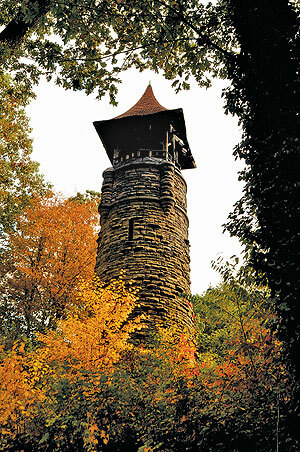 Originally designed by Akron architect Frank Weary, the tower is 64 feet tall and houses the 700-pound bell. Built in 1883 in three months, the tower was designed to complement the Civil War Memorial Chapel that opened 1876 and was restored in 2003, also by Braun & Steidl Architects. According to cemetery officials, in the early days, the cemetery caretaker pulled a rope to ring the bell at 6 p.m. each day to signal it was closing for the day. The bell was rung during every funeral procession in the late 1800s, but by the early 20th century, funeral customs had changed and the bell was silent except for special commemorations, like the end of World War I. Bell ringing resumed in 1930 when an electronic bell system was installed. ARRC officials said vandals stole the bell clapper decades ago, and the tower has remained silent ever since. In disrepair and in danger of collapse, the tower is now being restored with funds raised over the past several years, so that the bell may once again ring at funerals and other commemorative occasions. The project is expected to be completed in late summer, with a celebration to follow in September, ARRC officials said. The bell tower is adjacent to the cemetery’s main entrance and is listed on the National Register of Historic Places along with the Memorial Chapel, Caretaker’s Lodge and Cemetery Office. The cemetery is located at 150 Glendale Ave.